We had a great experience with Kansas City Sign Company! We had a great experience with Kansas City Sign Company! Proper expectations were established up front, the communication was great and the staff & service were very professional! Would recommend if you are looking for signage and we will be doing business again with them soon. KC Sign Company was absolutely the best to work with! KC Sign Company was absolutely the best to work with! Lee and everyone there listened to my needs, put me on the right products, and produced exactly what I needed and helped me stay in my budget. I highly recommend Kansas City Sign Company to anyone out there for any of your sign or banner needs. I really appreciate Lee getting all of my signs and installing. Kansas City sign company is very professional and affordable. If I need a sign made I will always go to the Kansas City sign company. Vinyl looks sharp and was installed well. Love the new sign they made!! Love the new sign they made!! We have a difficult logo to have a sign made of and they made it happen! Lee was an absolute pleasure to work with! Lee was an absolute pleasure to work with! The entire Kansas City Sign Company team was extremely responsive and professional. They do a great job beginning to end and every last detail matters to them. If you are looking for beautiful signage, give them a call and ask for Lee! KC Sign did a great job on the new sign for our building. KC Sign did a great job on the new sign for our building. Lee was great to work with. He made the entire process simple and painless. We would highly recommend them. Keith Geary American Rigger's Supply. We will definitely be using them for the rest of our box trucks. Lee and his team at Kansas City Sign Company have been fantastic! They completed a truck wrap for our moving company, they were easy to work with, flexible with scheduling and provided an incredibly quality outcome. We will definitely be using them for the rest of our box trucks. HIGHLY RECOMMEND! Excellent Service and Results! After contacting several other sign companies in Kansas City, I called Lee Mendenhall at Kansas City Sign Company about a unique custom sign for our Eye Clinic. he chatted with me on the phone, we had exchanged several emails and he had made multiple trips out to my office to help conceptualize, validate and simulate our vision for a reception area sign. Due to its special unique design which was pieced together, we have a brilliant sign which has totally exceeded our expectations. Furthermore, they are wonderful to work with. Any changes and communications throughout the project were done promptly and professionally. My only wish is that I'd have had them make my sign years ago. Thanks Lee for you and your team's help, talent, and service in making our dream sign a reality. 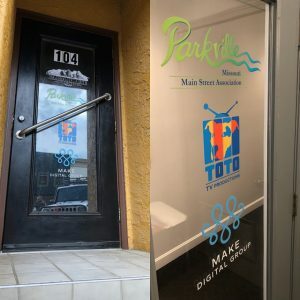 If you're honestly in the market for a professional looking sign and you want to deal with professionals, give this most worthy business a call. The final product came out just as we wanted. Very happy with the entire process! From our first meeting to final installation, KC Sign Company did a great job. Their rep was prepared with a variety of ideas and samples to help us visualize options. He listened to all our requests then we were given several sign options to fit any budget. The final product came out just as we wanted. It really makes a statement in our office. Can’t say enough about KC Sign Company. Can’t say enough about KC Sign Company. Lee and his staff are over the top with their service and the quality of signs they produce. I had a custom metal sign designed and cut by these guys. Turned out fantastic. Highly recommend. The team at Kansas City Signs were fantastic! The team at Kansas City Signs were fantastic! We had some customers in their area and they were terrific partners. They are professional, responsive and provide great customer service. Highly recommend!!! Professional and they were super easy to work with.